What's that you say, new things to read? The reason for the so called "technical difficulties" is that... well, actually school is winding down. That's always a busy time. But besides that, I've been working on other more mysterious things. Not sure if anyone's aware, but I updated the teaser blog for an upcoming project of mine. A simple sentence that makes you think. Read now. Besides that, I actually completed something recently (sort of) that I hope to expand over the summer months. Installation 04 has never just been about games and entertainment. It was also always rooted in original content and fiction. I know that I've done a lot of silly little stories in the past, but I'm working on some serious stuff at the moment (don't worry- the silly little writings will continue) that I hope to share really soon. Stay tuned. Well, not quite. But, yeah. We'll be back soon with new stuff. I promise. I swear by the mighty bean ferries and the squash farms of Plantoo IV and the Yettie cornmeal and... ok you get the idea. Ok, so there were some cool parts and some not so cool parts. At the very least, the game looks good. Besides looking almost exactly the same, the underwater thing looks sick. Might want to fix the drill, though. Seems a little too powerful. Don't you just love how the internets are always leaking things? The latest internet leak has revealed an all new gaming magazine from the guys at EGM, simply titled GameMag (though now that I think of it, that's even slightly more creative than Electronic Gaming Monthly...). Though the gaming journalism industry may be trying to keep these guys down, they just keep popping up everywhere like weeds. Not that that's a bad thing, especially for us gamers. This is just one project to spring up from the former EGM/1up staff after the UGO takeover/massacre in January. The project is being headed up by Dan "Shoe" Hsu and James "Milkman" Mielke and is being published by an all new company: Milkman Shoe Publishing, a joint venture by the two men which combines their nicknames together (again, how original). With control of the publishing now in their hands, they hope to be around for some time to come. The new publication will apparently bring along many of the old staff including (wait for it): Sushi-X! Woots! An official announcement was supposed to be made within the coming week, but it leaked yesterday anyway. Good for us. 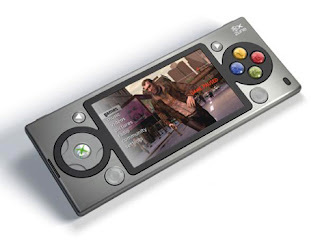 The device ran a mix of the old 360 interface and the Zune interface. The guide pauses the game and brings a drop down Zune menu from which the player can select options such as music playback and friends lists. It can play music, video, and view pictures, just like a Zune can. The system will ship wit 120 GB of memory built in, but Microsoft is considering also adding a memory card slot. At this point, they aren't sure if games will be download only or on disk. They stated it would be easier to make games as a download, but would have to figure out an easy way to do so. There will be online capabilities via WiFi and MS is experimenting with a Sprint partnership to have access to its 3G and WiMax networks for on the go gaming. The device will not have phone support. Why not AT&T you ask? One word: Apple. There will be Arcade support! The system will have dual analog sticks for a "true console-like experience." The D-pad will be used for gaming and media control. There are shoulder buttons. It will be slightly more powerful than the original Xbox. Microsoft ran Halo 2 do demonstrate this. Halo 2 is not actually a planned release game. No launch games have been announced at this point. The prototype differed slightly from the mockup. GM was not allowed to take any sort of pictures, so the only media at the moment is that mockup and some other early design sketches. It should be on display at E3 this year with tech demos ready. Microsoft will unveil new info at that point and possibly launch titles. Slated for release "in the next two years." That's including this year, but I'm betting It'll probably be out next fall. No word on pricing, but it will be "competitively priced." GameMag will formally launch this coming May. Be sure to check it out for all the juicy details not in the leak (though I think that's most everything anyone would want to know).